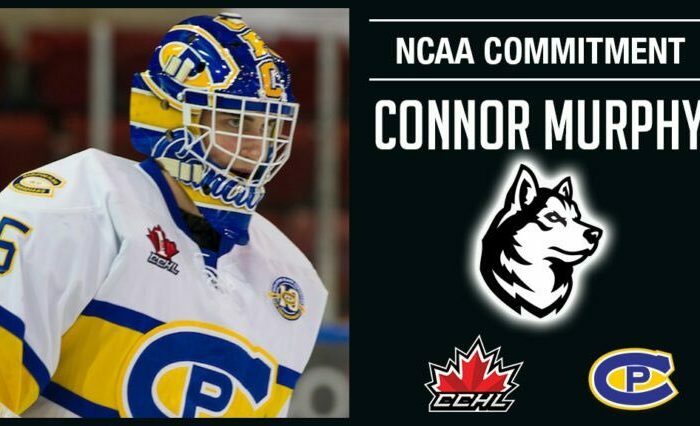 Boston, MA — In the battle for Husky supremacy, Northeastern continued their dominating ways against their counterparts from the University of Connecticut, sweeping the Blue Dogs in the home-and-home series by scores of 3-0 and 4-1. The Friday night shutout was Ryan Ruck‘s first shutout of the season, and first in a year since shutting out UMass on February 12, 2016. Over the weekend, he saved 44 of 45 shots that he faced. Friday night’s game went scoreless in the first period, but Northeastern opened up the scoring in the second off the stick of Sam Kurker, who potted a rebound off an Adam Gaudette shot gloveside on UConn goalie Adam Huska. Gaudette doubled the lead five minutes later, making a fantastic individual effort to bring the puck in alone, dance around defenders, and tuck the puck into the net before it was slammed off its pegs by a UConn defender. The initial call was no goal, but a lengthy review corrected the call in favor of Northeastern. Northeastern controlled the pace of play for most of the game’s remainder, until Kurker scored again with the UConn net empty with under two minutes to go. The goal gave Kurker his third goal of the season, and his first two-goal game since January 16, 2016 at New Hampshire. 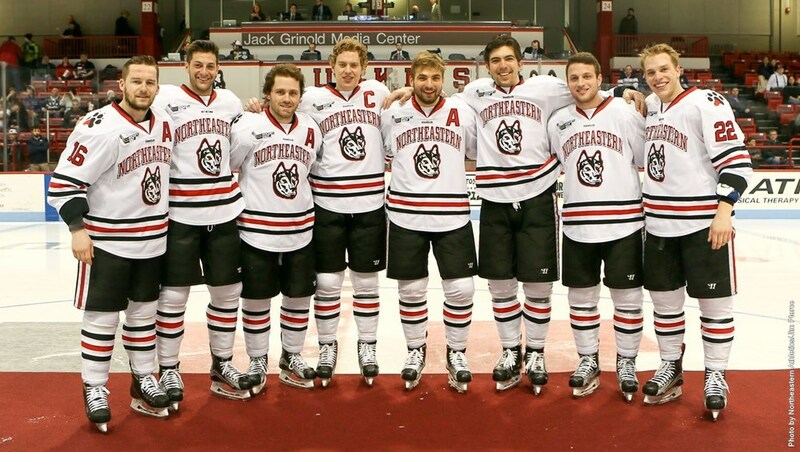 The Northeastern powerplay went scoreless in two chances, and the penalty kill held UConn scoreless in their two chances.Saturday night was Senior Night, with the night seniors in the program being honored in the pregame ceremony. In addition to the seven in the lineup, captain John Stevens suited up to be on the ice with his teammates before changing into a suit to watch the game from the stands, and senior Will Messa, who was a three-year letterman for the Huskies until this year taking a role in scouting and video analysis, was also honored with his classmates. Senior Mike Jamieson was given the A on his jersey for his last regular season home game, and was announced as an assistant captain. 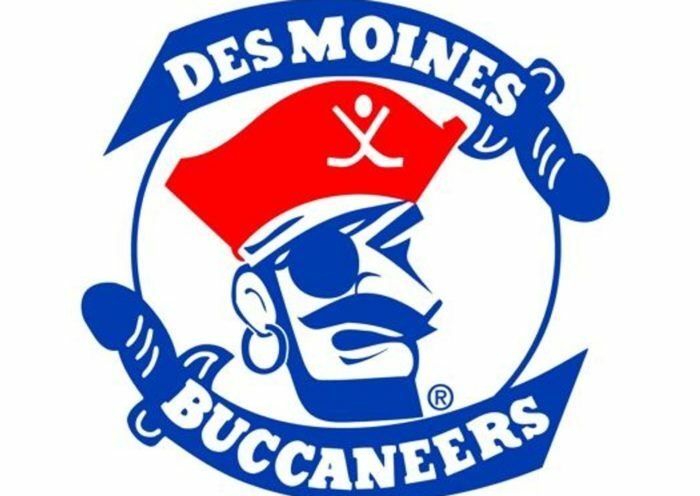 From the first period, there was never a doubt which team was going to win. Northeastern controlled play for roughly 55 of the game’s 60 minutes, and quickly regained control when they lost it. Senior Zach Aston-Reese continued his torrid pace for the season by scoring a hat trick and chipping in an assist, while Gaudette had a powerplay goal near the end of the first that tied the single-season record for powerplay goals with 14. Northeastern would give one goal back to UConn early in the second period, when a Gaudette turnover was bobbled by multiple Huskies, and couldn’t be cleared before Max Letunov swatted it past Ruck’s blocker. The Huskies went 1 for 3 on the powerplay, and killed off all three UConn powerplays. 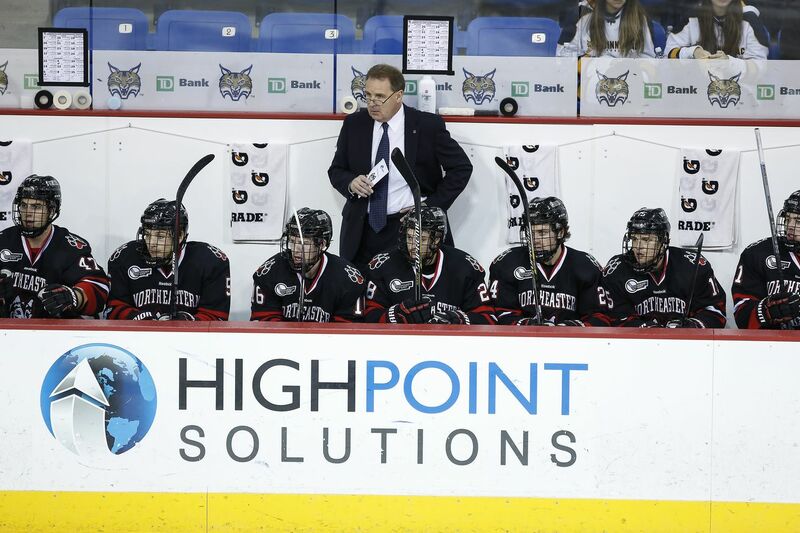 -Northeastern has now won all six games against UConn since the blue Huskies joined Hockey East, sweeping the regular season series each of the past three seasons. -Aside from the mishap that led to Letunov’s goal, the weekend was some of the best hockey I’ve seen Northeastern play in weeks. They dominated time in the UConn zone, and from Ruck out, everyone contributed and played well. As we noted, Ruck was very sound in net, controlling his rebounds better than he has in the past, and making some stellar saves, both at Matthews and on the road, to keep UConn off the board. -The defense cleared loose pucks from the crease, controlled UConn’s breakout through the neutral zone, and kept pace physically with a much larger UConn team. Fellow blogger Mike Downie agreed with me when we were highlighting some standouts- this was the best we have seen Jake Schechter play in his time at Matthews, and Eric Williams had a solid game as well. -Offensively, the story is going to be ZAR’s hat trick and Gaudette tying the record, but much credit must be given to the fourth line Saturday night. While that line will never be offensive forces, they cycled the puck extremely well Saturday night; two separate instances saw Northeastern have control for 45-60 seconds straight with them on the ice, playing keep-away from UConn. Defensively they were sound and did not get pinned back in their own zone- Biagio Lerario had an impressive game along the boards and below the goal lines, and nearly scored his first career goal as the buzzer sounded. -ZAR and Gaudette’s seasons deserve their own articles to highlight what they have done, as does Dylan Sikura. Once the season ends, I will put out a feature on the three of them, especially ZAR’s pursuit of the Hobey Baker Award. -Lastly, a special paragraph for the senior class. The nine individuals honored at the game have helped cultivate a massive change in how the Northeastern hockey program is perceived, how the team performs, and defined new levels of success for the program. 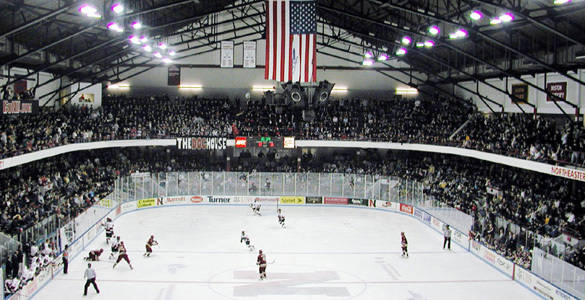 No only did they win the first Hockey East championship since 1988, but they are one of the winningest classes in program history, and they have improved every year they played here. Some of them will play professionally when they graduate, others will pursue other goals, but their impact on Northeastern can never be mitigated, nor every will be forgotten. Thank you John, Zach, Mike, Tanner, Ryan, Sam, Brendan, Jake, and Will for what they’ve done for the program, and for giving fans like us something to be proud of and cheer for every game.